Two things recently have made me realise I am getting older. When watching the corny What Women Want with Mel Gibson in it (the fact that I was watching it in the first place is somewhat unusual), I saw him and actually thought mmm, you're quite fit. I have also started listening to Annie Lennox. Now she is someone who's always bored me shitless with her 'meaningful' lyrics, her strutting 'strong woman' performances, her stupid bald head. Worse than Sinead O Connor, worse than Skunk Anansie, she led the troops of the skin-headed, mouthy, empowered yet surprisingly bland female, with no trace of irony in her lyrics or persona. She stood for everything I hated about pop music. So it seems, despite my best intentions, I am descending into middle age. 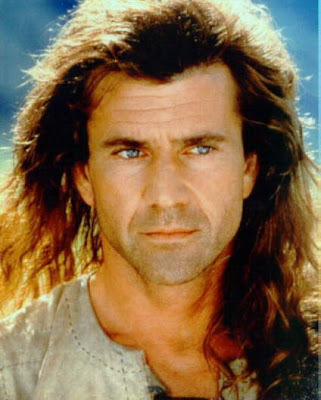 Mel Gibson always turned my stomach with his hairy chest, and in the Eighties, his horrible mullet hairdo. Only housewives ever fancied Mel. However in the wake of Iggy Pop gyrating about our billboards and TV screens selling insurance (how could he do that, why would he do that? ), I realise that even I must embrace the middle road from time to time. I hit rock bottom a couple of weeks ago when I found myself crying to No More I Love Yous and had to admit - Annie Lennox is a fine songwriter. So if John Lydon sells butter, and Iggy Pop sells insurance, and most other pop stars who haven't had to perch upon the pedestal of 'anarchy' 'rebellion' 'integrity' or 'debauchery' are busy selling their small souls, and further, I am listening to Annie Lennox, what is left of the rock n roll dream? Of poetic excess? Can you imagine Bukowski selling tinned pheasant in Harrods, or Rimbaud down at The Groucho Club spouting off about his latest line in aftershave? I have little hope left for our culture, for myself. But when finally I see Patti Smith endorsing Macdonalds, or Morrissey advertising the latest IPod, then I truly will give up the ghost, and write modern culture off as the mediocre rubbish it so dangerously comes close to being. ps Someone just pointed out to me that the only reason I fancy Mel Gibson in What Women Want is because he is cross-dressing. Hurray! My old identity is intact. I feel better. now i have to run for a 4 day weekend in Mexico, but looking forward to read your post on Pema Chordron and some of her literature as you make her sound grand!